November 11th, 2018 – Pete Davidson made a rare move last night during the taping of Saturday Night Live. Just one week after making a joke about Lieutenant Commander Dan Crenshaw, who wears an eye patch after losing his eye in Afghanistan, Davidson apologized and even brought the war hero onto the the Weekend Update desk to make amends. The SNL star began the segment by sarcastically acknowledging that his comments last week must have come as a huge shock to those who know him. After a few more self-deprecating jokes, which included sympathy for his mom who has to both put up with and live with him, Davidson shifted back to a serious tone. At that point, Crenshaw, who just won his bid to represent Houston in congress, slid over and agreed with that last sentiment. He hasn’t been alone in that thinking. Those on the left and right certainly did come together to widely condemn the joke. But unlike Fox News host and Trump confidant Sean Hannity, who said that everyone at SNL “can go straight to hell,” Crenshaw showed a lot more forgiveness and levity. The veteran then got his turn at “First Impressions,” the segment which initially landed Davidson in hot water last week. Crenshaw played along, and landed some solid jabs as Davidson’s picture appeared beside him. Following the jokes, Crenshaw reminded viewers that this can be a teachable moment. We can be reminded of forgiveness, and we can take some extra time to reach out to veterans this weekend before the observance of Veterans Day on Monday. He went on to say that we should never forget the sacrifice of those who fought for us and those who we lost in 9/11; making a reference to Pete’s father who died responding to the attack. SNL‘s decision to make such a lengthy apology caught some people off guard, as the sketch show usually follows comedians’ rule to never apologize despite negative reactions to controversial jokes. People took to Twitter to praise Davidson for his decision and to give kudos to Crenshaw for his pretty skilled comedic timing. Thank you to Pete Davidson for apologizing to Dan Crenshaw. Dan Crenshaw, thank you for accepting the apology and giving us all a laugh. This is what resolving a problem looks like and we need more of this. 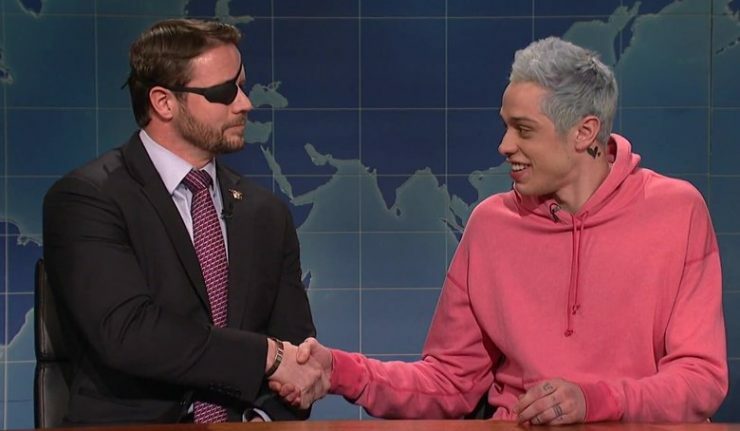 What did you think of the Pete Davidson, Dan Crenshaw moment on SNL? Was this the right move after last week’s joke?